The world feels real. It feels well researched and natural. 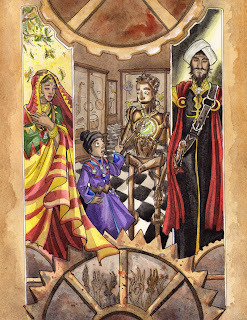 I admit that this is my first foray into steampunk, and my knowledge of the Victorian period is limited, but from what I do know this story feels right. I believe this is because the characters feel real. There are not many pages in the book but the character relationships are developed and believable. 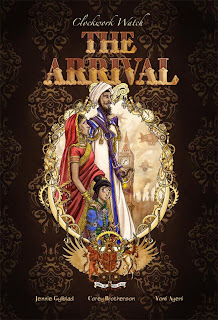 Janav's confusion and frustration at the move to England is obvious, and the subtleties of Tinku's and Chan's relationship are well portrayed. 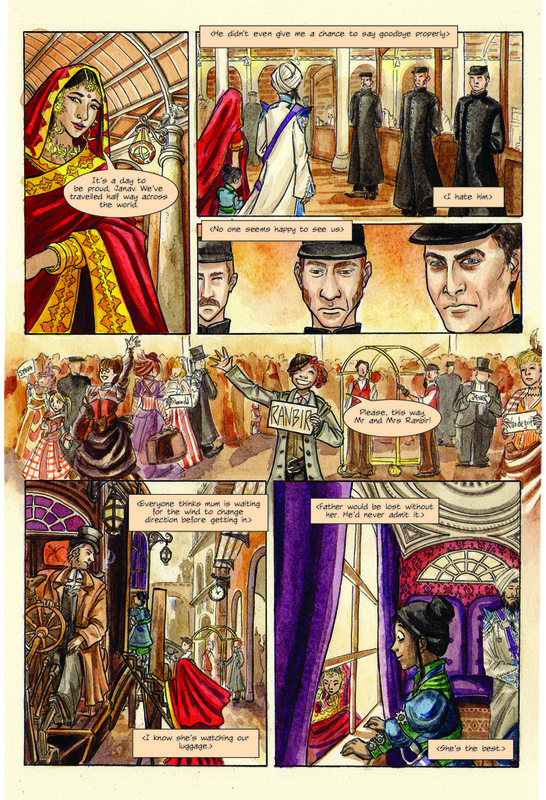 Even the other characters that we see for just a few panels give us a wealth of information about the Ranbirs and Victorian life. I think it is significant that Tinku, Janav's mother, is a major character. Quite often mothers and female characters get sidelined in fiction and, while Tinku has little dialogue, her personality and presence is strong. This is a credit to Jennie's artwork, more of which later. I am drawn into the book and I marvel at it whenever I read it. 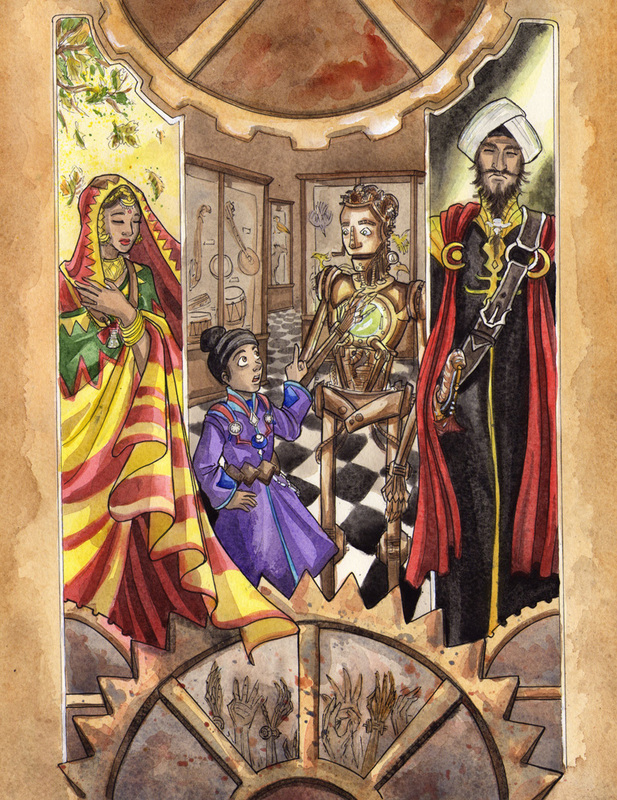 The book is painted in watercolour, giving it an aura of high art, yet when you look closely you see that it also has cartoonish elements. 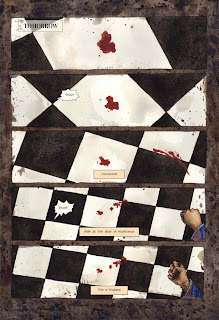 Other comic artists, such as Dustin Nyguen, paint in watercolour, but with less of a cartoon style. This makes Jennie's work feel unique and even more special. The colours are fabulous, the faces are expressive, the layout is perfect. The lettering and the speech bubbles are good. Bad lettering can ruin a book but good lettering fits seamlessly with the art and plot, and enhances the whole reading experience. 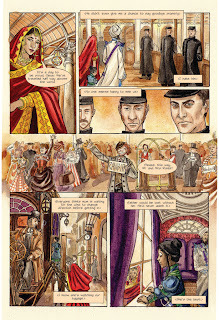 One thing I didn't notice until my third read through was the speech bubbles for the clockwork servant - cogs are incorporated into the design. It's a simple idea and works really well. Thanks to Jennie for letting me take the images from her blog. Clockwork Watch is much more than just a comic - it's a transmedia project incorporating the comic, films, exhibitions, interactive theatre, role play, letters, prose stories and more. Readers can get involved by submitting story ideas, photographs, letters, and news items, and attending live events. Linked with this, the book includes newspaper articles from The London Gazette, adverts from the era, a page or two from Corey discussing the adaptation process, and a sneak peek into how Jennie creates her art. More information on how to get involved can be found on the website. Buy The Arrival here for £10. 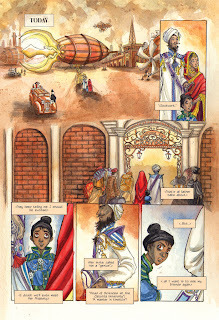 You can also purchase a 2013 preview book containing glimpses of the Arrival, glimpses of the next comic (Breakaway), a closer look into Janav's family, information about live events and collaborations, and a look into how Jennie creates the art - from simple lines to the full watercolour finish. Jennie Gyllblad's website is here. She has also published a book named Skal and she does a webcomic named Jenspiration. I highly recommend you check them out. 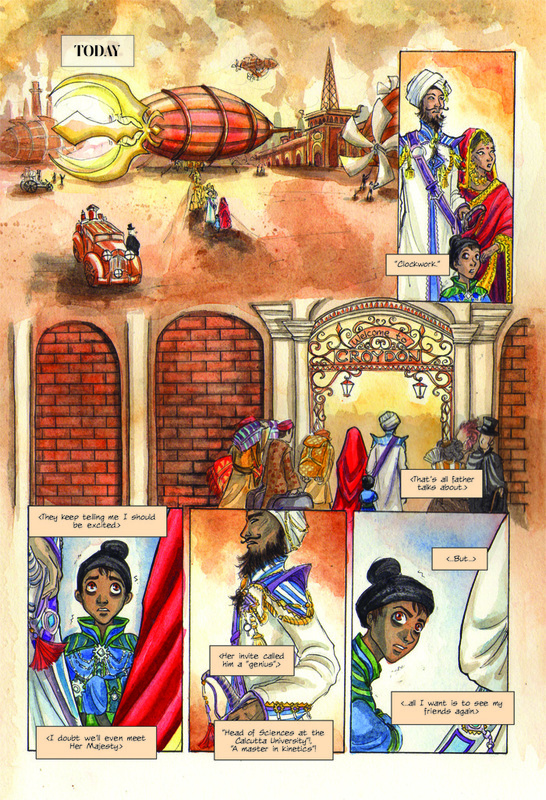 Skal is done in watercolours and is about a fantasy Arabic world; Jenspiration is a doodle blog. Corey Brotherson's website is here. He has written a number of other things, of which I have so far only read Magic of Myths. There will be a review of that coming up soon. Yomi Ayeni's website is here. He tells interactive stories. A review of his last film, Breathe, can be found here. Corey and Jenny also contributed a story to Bayou Arcana: Songs of Loss and Redemption. Their story was by far the best in the anthology.